Myth: It is safe to look at an eclipse of the sun through several darkened negatives or a piece of smoked glass. Fact: It is never safe to look directly at an eclipse through any device except those scientifically designed for that purpose. Because people believe this myth, eclipses of the sun create a lot of visual loss. 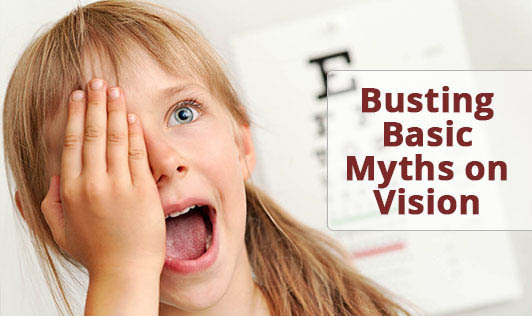 Myth: Dry eyes are just a condition of the eyes. Fact: The eyes often reflect a larger problem that needs to be treated systemically. Certain nutrients such as vitamins A, C, D, E, & B6, Magnesium, GLA & DHA and Mucopolysaccharides may help ease chronic and severe dry eyes. Fact: According to AAO [American Academy of Ophthalmology], computer use won't harm the eyes. However, when using a computer for long periods of time, the eyes blink less than normal (like they do when reading or performing other close work). This makes the eyes dry, which may lead to a feeling of eyestrain or fatigue. Make a conscious effort to blink regularly so that the eyes stay well lubricated and do not dry out. Myth: Lack of Sleep causes Bags and Dark circles under the Eyes. Fact: Dark circles under the eyes have always been considered a sign of late nights and lack of sleep. The cause of these dark circles is often blamed on stress, too much sun, too little sleep, menstrual disorders, kidney dysfunction and even too many fried, frozen and canned foods. The eyeball of a human weighs approximately 28 grams!